Women’s rugby worldwide has never been healthier. More players than ever before, more media coverage, over 100 countries regularly playing sevens, and more nations than ever interested in hosting the 15s World Cup. But as the game advances one nation – one major rugby nation, South Africa– stands out. We commented on this in our review of the African Youth Olympic qualifier recently, where they failed to take part just a few weeks after they also pulled out of the senior African Sevens. 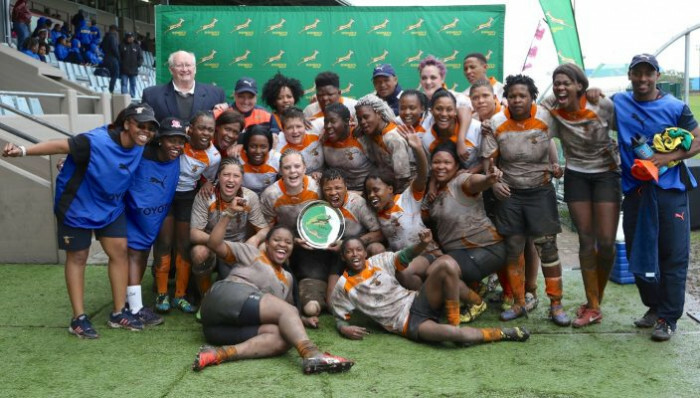 South Africa should be one of the great powers of women’s rugby. A wealthy union, a great rugby tradition, and more female players (according to World Rugby) than any other country in the world. Between 2010 and 2014 South Africa’s test team beat the USA and Wales, regularly took part in summer tournaments in Canada and came within a point of beating England, while their U20s beat England, and their sevens team was a member of the World Series. But since 2016 South Africa have been withdrawn from the Olympics, withdrawn from qualification tournament for the 2017 World Cup, withdrawn from this year's African Sevens, and - as a result - will not be at this year's Dubai Sevens, and will not be at next year’s Hong Kong WSWS qualifier. And they are no longer Africa’s number one ranked sevens team. Their test team will go on a short tour to the UK this Autumn, but that positive aside, what is going on with South African rugby? We’ve spoken to people associated with the women’s game in South Africa, and this is what they told us. “The number of problems women's rugby is faced with in South Africa are far more complicated than the decisions others only see after the fact. It's political, it's gender political and it is also due to the fact that those in "power" have very little understanding of business principles, the most important aspect in relation to this is the complete lack of a simple process such as planning. “As you said, South Africa claim to have the largest number of youth players, but this is only an outreach/participation programme where persons are introduced to the game. They are no real competitions or structures for them. “There is a separate programme - High Performance youth training centres (HPYTC)- where some promising players are identified who may go on and play in the senior teams. The programme falls under SARU appointed coaches and the number of players is limited. “For example, there once were eight senior clubs in the Pretoria region, but until last year this had fallen to just two, the most successful of was forced to start playing on the international circuit due to the lack of any formal club competition in the region. The clubs played in a local tournament last year which has stimulated the formation of "new" clubs based in the Government related services (Police, Defence Force, Correctional Services, etc. ), but there is still no club competition and most of the Provincial squad are recruited either from outside the area or by phoning around to find players to determine available to play. “The current situation is therefore described as, "a bit of a mess". There an "SARU Strategic Plan" that was forced by SARU, due to the lack of results one year before the end of original 5-10 year plan. This apparently highlights the lack of proper planning and monitoring. In short, this indicates a process not properly managed.